The year is 2640. The name of the game is odd and long. The Private Mercenary Company (PMC) eagerly awaits new contracts, and new earnings. This is PMC2640 (http://assaultpublishing.com/pmc-2640/)! This blog is about a campaign where I will let you follow the (tragic) fate of the company; Order of the Twin Sickle... or Sickles, for short. The private company board has elected captain Staya as its... erm... CEO! With the mission to bring fortune and death upon contracted enemies of the state! Erase the last part, it should be "enemies of the contractor", of course. Captain Staya and his trusty 2nd in command; the dog Stoy (pun intended). So this pseudo-neo-communist company has a slogan "United comrades in foreign countries" and have a (now eternal) enemy. The Joel company, who in contrast to the Sickles are evil capitalists whose only purpose is to gain unimaginable wealth! The company history has showed that this is absolutely not the case for the Sickles, almost bankrupt. 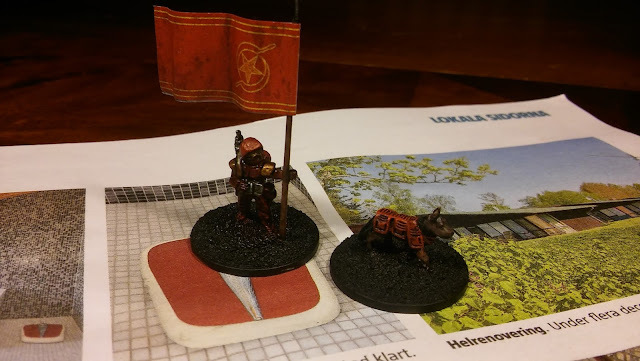 Conclusion: Me (Gabriel) and my friend (Joel) started playing PMC2640 and started a campaign, which is all supported by the rules (which is nice!). Great game in my humble opinion, and the creator answers really fast when we have questions! Big thumbs up! Follow us and the fate of the Sickles! Za Sickles! And stay tuned!